Price Drop! Was: $89.95 Now: $29.95. For a limited time only, while stocks last. 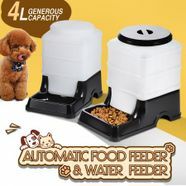 This is a wonderful pack of 2 automatic pet feeders. Can be used as a dry food feeder and water bowl. Whether you are a traveler and often away from home or just a pet owner that wants a simple way to dispense your pet's food, this automatic feeder will offer you not only a practical, meaningful way of caring for your pets, but also peace of mind. When the pet food or water is almost gone, the storage in the container will come out slowly, which makes sure that your pet won't go hungry or get too full when you are not at home. Suitable for most home pets, such as dogs, cats and even mice, guinea pigs and birds. This product comes with a 30 Day Warranty, please click here for details.